My driving licence arrives in Harare just before we set off again, luckily. I am delighted to leave the city and love being back on the dusty road with fields and trees for miles in every direction. 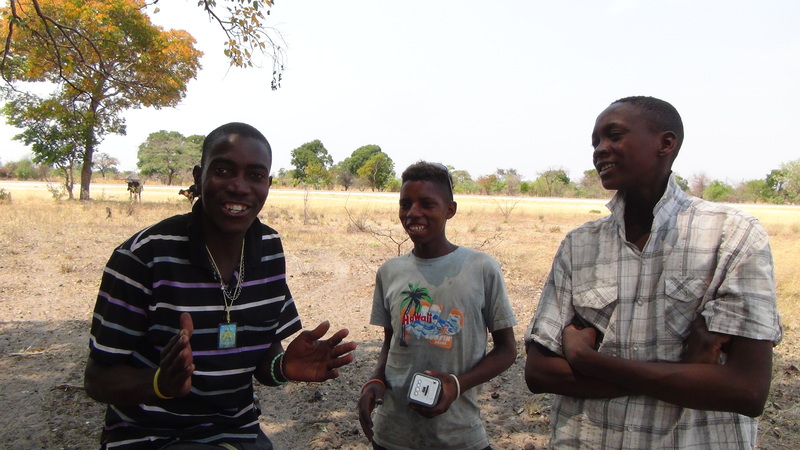 We catch up with Emma and Mike just in time before the border with Mozambique: we have their visas and passports and we can all celebrate Robert’s birthday with watermelon and chocolate cake. Stopping to eat or go to the toilet has become a public event. Small children run towards us calling, “sweets, sweets”. Older ones stop and stare or join Emma running. There are people, everywhere. Every few yards there are clusters of homes. Some are neat with a sturdy fence surrounding them. Others are carelessly built, fenceless, at risk of wandering hungry cows. Cows, dogs, donkeys and goats ramble at will. Being in the second half of the dry season there are only dusty stalks of grass and spiky bushes for the cattle to eat. 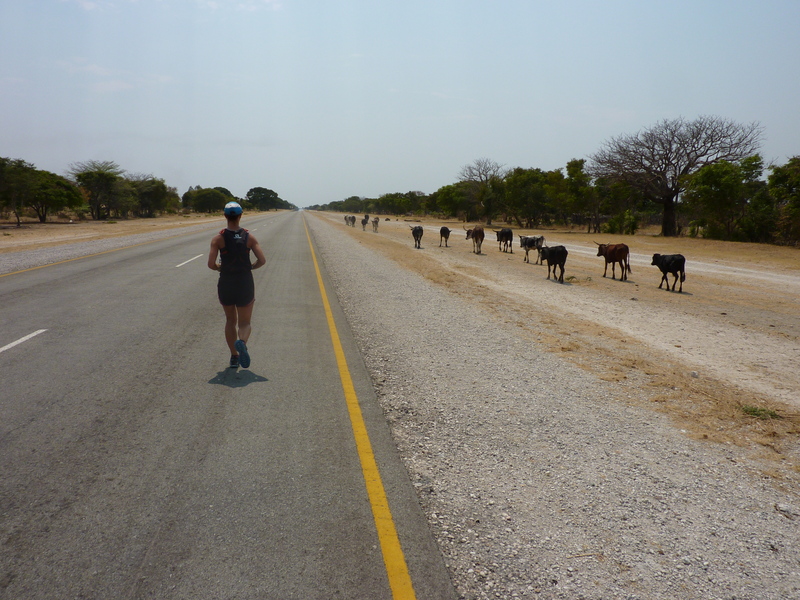 Through this activity the high quality tarmac road from Grootfontein cuts a straight line to Rundu: enabling cars to noisily speed and inevitably collide with innocent animals. A dead donkey and a crushed car lie on the side. Children seem to be wise and careful of the road. First thing in the morning, one of the children from the previous evening arrives asking for food. I do not know if this is out of need or the simple joy of a gift from someone from another world. Erring on the side of caution, I give her an orange. Children across the world go to school hungry, I have no way of knowing if she is one of them. In addition, I think my 7-year-old self would have been equally excited to have a gift from unusual foreigners. She grins with delight and bounces off, throwing and catching the orange as she goes. For lunch, we find a quiet stop 20 yards off the road under a huge tree. Soon three 20 year olds come by, I think they are looking for a job, but stay to watch and chat while I cook. Kindly, they leave us soon after Emma and Mike arrive. Hello! I wonder if you’ll ever find this photo of you on the internet. Hope you like it. Whilst we are eating, in the distance a troop of small children head our way, but a swirling dust devil frightens them off. Dust devils are dangerous for children. Like a mini-tornado that arises from nowhere, stories abound that they can pick up an adult. Seriously! It’s not just an urban myth, it’s in Wikipedia. The small children don’t come back. Maybe they think we sent it. It feels like someone sent it as we get to finish our dinner almost undisturbed. Group no 3, these were the guys I spent a bit of time talking to, they were really nice. The school children are there to laugh and interact. Group no 3 are fascinated by everything and want something, anything. They don’t understand that we do need our kit and cannot easily get more. It’s a pleasure / pain experience: it’s great to connect and interact but after a while the pressure to entertain means it would be nice to have a break. Chatting to them is interesting, though, even with the language barrier. 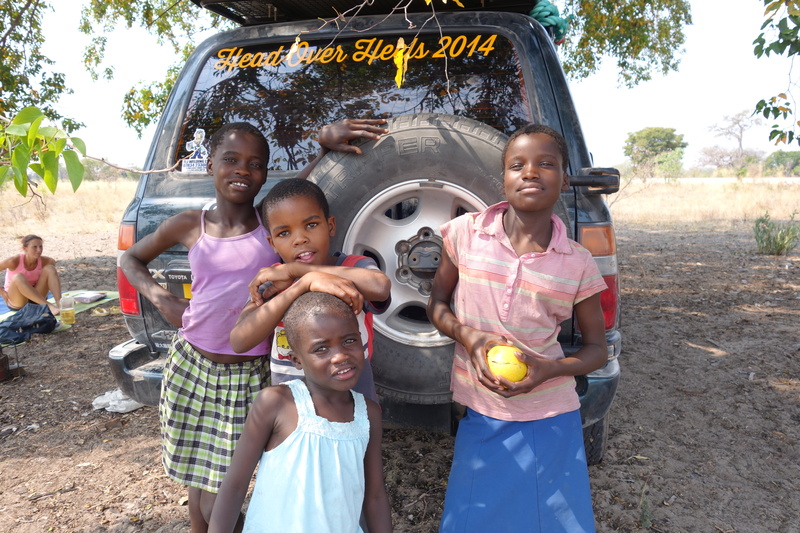 When I point out Namibia and Angola on our maps, with soft reverence they chorus, “Angola”. Many of the children are refugees displaced by the war. Clearly, their hearts long to go back. But the team needs to rest. It takes several attempts before they will leave us. Short of an hour they are back, waking us up. We must be an exciting event, it’s not every day a woman who is running across Africa is snoozing in your field with her team and all their specialist kit. I try to distract them by showing them our leaflets about the run … then they all want a leaflet. Emma has to give up on resting and sets off running early. The children shouting and screaming, scamper barefoot alongside her. This group drops off quickly but Emma has to deal with this frequently throughout her run. Luckily, she has Mike keeping by her at all times. Two impressive women: one running across Africa; the other jogging for many kilometres, to go and stay with her mum for the weekend. For the next 6 hours, there is nowhere to pee in private. Nor can Woocash and I find anywhere to camp. Eventually, we stop outside a clean and tidy looking compound. A big friendly guy comes running up to check we are okay. When we ask him if we can stay on his land. He goes off to ask his wife. (I don’t know why it makes me smile when I write that. Maybe because he was a big impressive guy and everything he did was so cheerful.) His wife, however, is clear, “No, it is too dangerous.” They, themselves are about to leave and don’t stay there at the weekend. On his advice, we pick up Emma and Mike and head north to find a campsite. Daylight was fading by the time we turned right onto a long dusty track to Samsitu campsite by the Okavango River. Emma and I were sure it was going to be closed. Happily we were wrong. Andy invited us to stay 3 comfy nights in beds. Hooray!